I decided to tackle the projects in what I thought would be the most difficult first to the easiest last. I started with the bathroom. Bathrooms are just a pain. You have a million corners and edges and things to paint around. Still, that actually went pretty well, and we used the new Behr paint that is Paint & Primer in one, and it actually went on really good to the point where I didn’t need to do a second coat! That’s always a bonus. We went from a teal color to a slate gray, which looks good with our white fixtures, tiles, and counter. The second room I tackled was Little Boy Beagle’s new room. I ranked this second because I wasn’t sure if I would need two coats, plus it was the bigger of the two bedrooms. Again, things went on pretty evenly. I didn’t have to do a full second coat, though I did edge a full second time, and had a bunch of spots where there were slight spots of the old color. All in all, not bad. The room I had ready to go last was the one I thought would be the easiest. We were keeping a similar color to what was there before, but decided to repaint because the walls had gotten a little scuffed around where the desk used to be, and we had a couple large shelves hung that left big patches to fill in after I filled in and sanded out the holes. Still, we figured that one coat ought to do it. When we were at Home Depot, we mentioned that we were looking for a gallon, and the lady pointed out that they were clearing out a brand of paint that they were replacing, and that the gallons were marked down to $10. Red flags should have been going off, like asking “Why are they getting rid of it?” But, the lure of 50-60% savings was overpowering, so we had them whip us up a gallon. 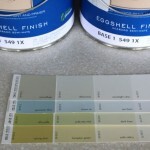 Same type of paint (latex), same finish (eggshell), and very close in color. Should have been a breeze, right? As soon as I started painting, I could tell that this wasn’t going to be as easy as I thought. It seemed to be very wet, something that became even more apparent when the windows started fogging up due to all the humidity. The high water content made it take a long time to dry and a second coat would be needed. No problem, it’s not a really big room, so I figured I’d go to bed, wake up and tackle it. When I went in the next morning, I almost threw up. For whatever reason, the areas in the corners and edges that I had to do with the brush, looked horrible. Now, I’ve painted a lot of rooms and I’ve gotten better at it as time has gone on, and I know that edges require some additional going-over, but this was not good. I put on the second coat and second coat of edging. After it all dried, I could STILL see the edges standing out. Thankfully the rest of the walls looked pretty good after the second coat. I had to do a THIRD coat of edging. Arrgh. I’ve NEVER had to do that. This was supposed to be a one-coat quick-fix. After the third coat, the edging looks….okay. If you look close you can still see the difference, but given that it’s a guest room (read: hardly used) and given that the long-term plan is that it will one day be the ‘Big Kid’ room for Baby June Bug (i.e. we’ll need to re-paint it again in a few years, my wife and I decided we could live with it. Still, the $15 that we saved on the paint….so NOT worth it! I made a comment, though, that as bad as it was for one room, I couldn’t imagine painting a whole house with that. There probably were people out there that, assuming this was a chain-wide change in strategy, saw that this stuff was on clearance and looked to get a whole lot done with little money. Probably not. Just a reminder that you get what you pay for AND that if something looks too good to be true, it probably is. How Is Sherwin Williams Paint? With the basement renovations approaching, one thing we’ve been looking at is paint. In the past, we’ve used a lot of Behr paint at Home Depot. 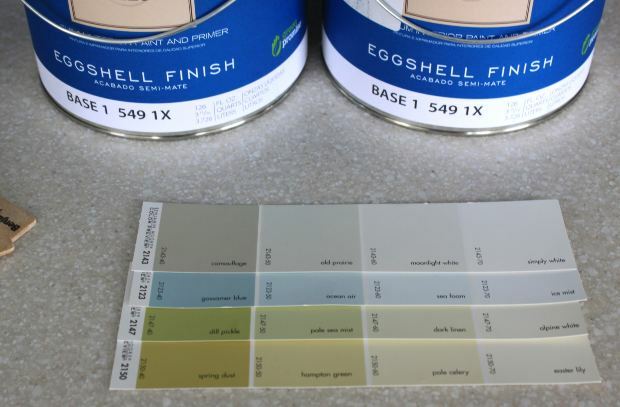 I’ve read and heard that there’s lots better paint out there so we were thinking of using Sherwin Williams for our paint needs in the basement room. Anybody have any thoughts on it? There’s a Sherwin Williams store near our house. They had an event this past weekend where they were selling all of their paint for 40% off. We didn’t do that, because we didn’t want to be rushed, but I have a coupon for 25% off that’s good until the end of the year. (You can print it here). Paying the extra 15% will be worth it if it’s good paint and we make sure we get the color we wanted. This past weekend was pretty crazy and it just wouldn’t have been possible to get the paint without feeling rushed, especially since we haven’t looked at furniture and have only found one carpet sample that we like, meaning we need to do some work there as well. Let me know if you have any positive or negative things to say about Sherwin Williams paint.